International Airlines Group (IAG) — the parent of British Airways, Iberia, Vueling and Aer Lingus — will launch a low-cost transatlantic airline in June called Level. Level will be based in Barcelona and commence operations with flights from the Spanish city to Los Angeles, Oakland, Buenos Aires and Punta Cana. Flights will be operated on Airbus A330s configured with just two classes; economy and premium economy. Fares will start at $149 with economy passengers paying extra for checked bags, meals, seat selection and WiFi. IAG said in January that it would launch a long-haul operation out of Barcelona. At the time, IAG didn’t say whether the new operation would fly as a new brand or whether it would operate as a low-cost carrier. Level is IAG’s answer to the growing discount transatlantic operations of Norwegian Air, Wow and WestJet. Its Barcelona-Oakland service will compete directly with Norwegian Air, which will launch that route on June 5. Level is also IAG’s low-cost answer to Western Europe’s two other major legacy airline groups. Lufthansa agreed late last year to lease 40 aircraft from struggling competitor Air Berlin, with 35 of those planes to be put toward an expansion of its low-cost unit, Eurowings. And last November, Air France-KLM said it would launch a new company to operate out of Paris Charles de Gaulle alongside Air France. 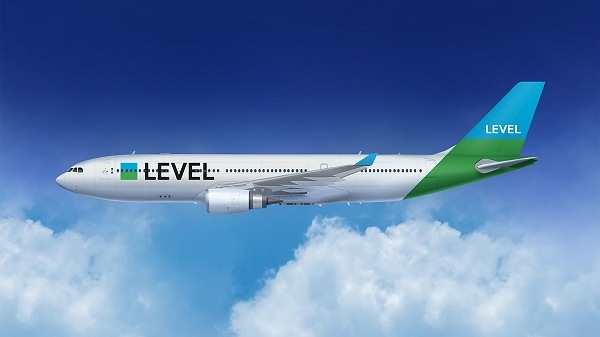 Level will launch its Barcelona-Los Angeles route on June 1 with two flights per week. Oakland flights will be operated three times per week, beginning June 2. Service to Punta Cana and Buenos Aires will also begin in June. To read more at Travel Weekly, click here.